Shhh! My wife told me no more trains… but it was so beautiful, it was so nice… how could anyone with heart buy just one Horizon Express. Let me review the model with you and I show you some videos of the two sets working together. 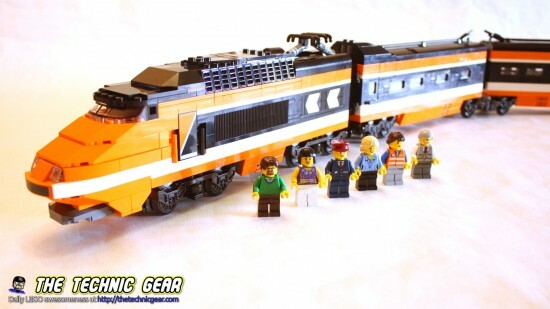 You are just 200€ away of LEGO High velocity train. 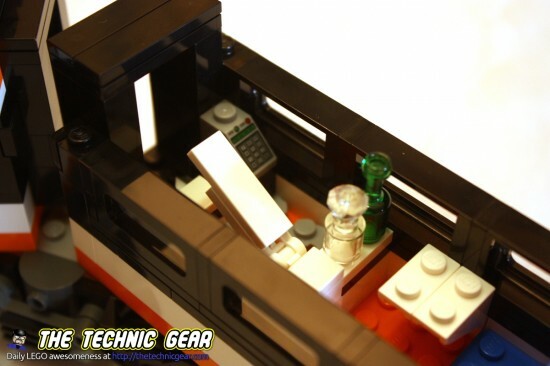 Where can I buy LEGO 10233? 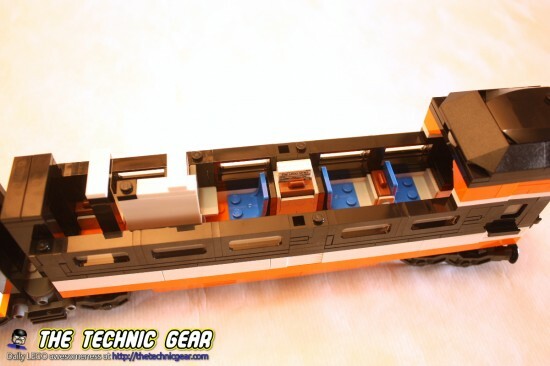 Build the ultimate high-speed LEGO® passenger train! Fly down the track in the Horizon Express! 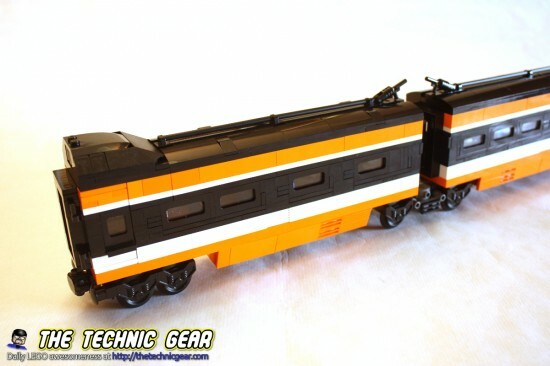 Collect this highly detailed LEGO interpretation of a modern, high-speed electric passenger train! The detailed body features black train windows, brick-built chevron detailing, extendable pantographs, printed windscreen and brick-built doors. Remove the roof to play inside 2 detailed passenger cars! Steer from the front engine car with, a control panel and brick-built electrical box! Then take to the tracks in luxury with the first-class car’s seats, luggage, newspapers, computer screen and even a bathroom with sliding door! The rear car features a bar with hinged counter, tables for the passengers with seats, a coffee machine, cups and bottles. 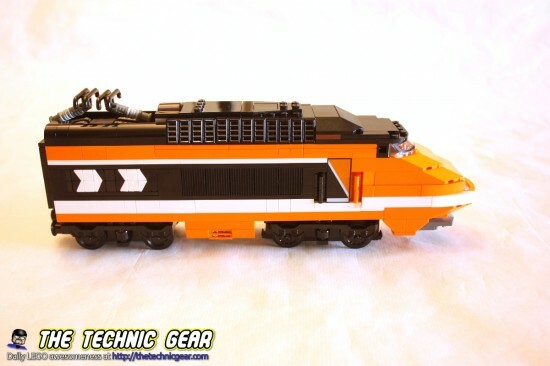 For the ultimate high-speed experience, attach a second Horizon Express model, or motorize it by adding LEGO Power Functions! 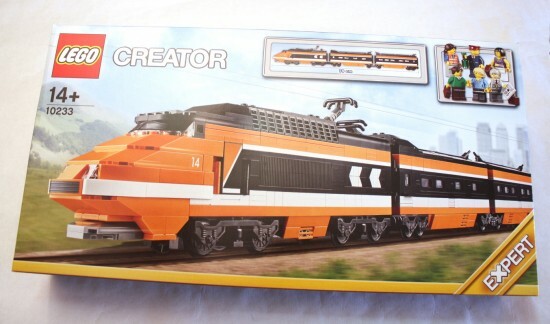 The Horizon Express, or LEGO TGV as friends know it…, is packed in a decent big box, although not big enough for you not to feel bad. The backside has some of the features of the model like the toilet, the coffee machine, the shop, the train driver seat. It also explain what you need ( huge amounts of money ) to add Power Functions into the train. The instructions manual is compromised of three booklets. One for each car of the train. The last manual has at the end ten pages or so about how to add the motor and the IR receiver which it is quite straight forward. The model is expensive but at least the Horizon Express is quite interesting to build, not as much as other LEGO Creator sets like the Pet Shop or the Grand Emporium, but definitively there are quite a few techniques to learn here. I can remark three parts right now, the frontal part of the train that it is attached in a incredible and solid way to the train, the black and white arrows at the train head and the way of building the windows of the other cars. The only negative thing is that both cars are built in a very similar way. Here is the timelapse building. The Horizon Express looks awesome and it looks even better with two sets together ( it is a must really ). Let me first show you the model at work. Ok, so let’s review it. This part of the train looks awesome. 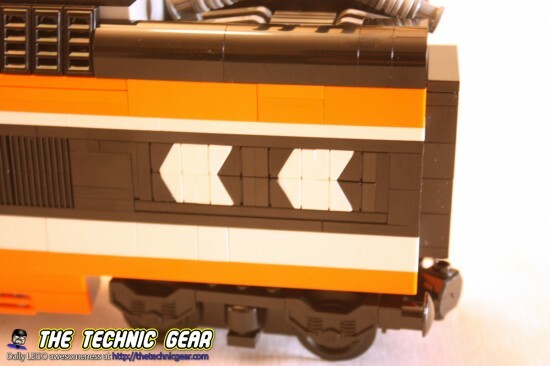 The front part, the nose of the train is built separately of the rest and attached in a very clever way. There are three things that I would love to remark. The arrows on the side are built using LEGO bricks! Yes, only lego bricks!. It is a very clever way of doing it and attaching them to two horizontal bars at the sides. It is a great technique that I didn’t know. I have seen later something similar to write the work Shop at the Grand Emporium set. As the set comes with no Power Functions parts ( doooh! ) 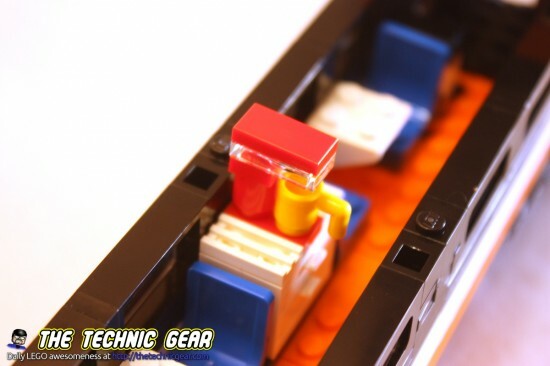 LEGO designed some parts that looks pretty much like the IR receiver and a motor that it is as wide as the battery box. Finally on the end of the locomotive there is a pantograph ( I looked on the Wikipedia for this )… it is the hook that drives the electricity from the cables to the train, but that in the LEGO PF trains is purely decorative. This car has three seats in blue and something that looks like a WC but what I think it is the most interesting part is the windows. The designer used a nice technique to build the little train’s window using long tall standard windows that are placed in landscape. It is a bit of pain to build them but the result looks fantastic. The two bogeys, the wheels of the train so we understand, are different, one of them is the standard bogey and the other is shared between two cars. This car has a lovely shop with bottles and a shopping box. Then near it there is a table with a coffee shop over it. The windows are pretty much like the first car and really good looking and as I said before this model shares a bogey with the first car. 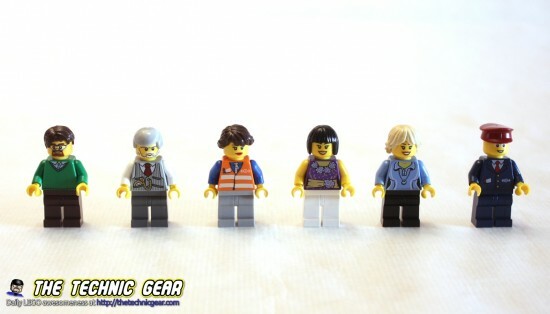 The set comes with lots of minifigs, six to be exact, three women and three men. The train driver, the steward that ask for the tickets ( tickets please! ), the man with grey hair and a watch on this pocket, a man in green sweater, and two women. 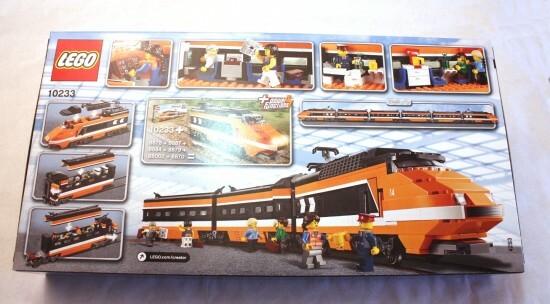 I think it is a great set, I would buy again eyes closed, but I really advise you against it as a first-train model, still my favourite train set is the 7939 Cargo Train… it is so complete. Does LEGO 10233 worth the money? Ummm… it is hard to say. I would buy it again as I have said but I am not so sure it is worth the money. If you are interested in it, buy it from the LEGO Shop before it is retired. Or try Amazon… who knows, perhaps they are running a great offer. onde voce achou o lego x-cross ob.